When your home is infested with any type of insect, no matter how dangerous or harmless it may be, you probably aren’t going to welcome any creatures into your home or let them stay once they’ve made their way inside. Asian Beetles are an insect that although harmless, you don’t really want on your property, whether you like bugs or not, simply because they’ll come in large numbers, taking over different areas of your home. Luckily, at Eco Tech, we know what attracts these beetles and how to exterminate them, having years of experience working as St. Paul, Minnesota, pest control experts. Asian Beetles are native to Eastern Asia, and they’re used to a warm climate, which often means that they can be found hiding in your siding, roof, windows, or any cracks in your home just big enough to shelter them from a cool draft. To rid your home or business of these pesky beetles, call the St. Paul pest exterminators at Eco Tech. At Eco Tech, we’ve made it our mission to help home and business owners all over St. Paul rid their properties of unwanted insect pests and wild animals. To this end, we’ve also been working to perfect our extermination techniques to provide you with the best St. Paul pest control service available. With our professional exterminators, you’ll find that we not only know what we’ve doing, we do it best. With an understanding of every insect pest we’re hired to exterminate, we know where to find the Asian Beetles making your house their home, how to draw these beetles out, and how to remove them from your home so that you aren’t left with a mess to clean up once your beetle infestation is under control. We’ve even created our own organic, natural pest control treatments for insect pest extermination, providing you with a less toxic alternative to traditional treatment solutions. With our less toxic pest control treatments, you can rest assured that your children and pets won’t be harmed while you’re trying to rid your home of Asian Beetles. The good news about Asian Beetles, and what you might not know unless you’ve done your research or gotten close enough for these beetles to bite you, is that they don’t actually bite! 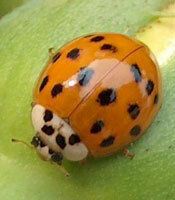 In fact, they’re a harmless insect pest that causes no harm to you or your home. The most these beetles can do is burrow into the nooks and crannies of your home looking for warmth and give you a small pinch if you aggravate them too much. All in all, though, Asian Beetle removals are very simple exterminations, as these insects are easy to find and easy to remove. If your home or business has been taken over by Asian Beetles and you’re sick of trying to get rid of them yourself, look to Eco Tech for a reliable St. Paul pest control service. To take advantage of our less toxic pest control treatment options and skilled pest control experts, call our exterminators at any of our regular service numbers, 763-785-1414, 612-237-8282, 952-881-6662, or 651-633-8600, or for 24-hour emergency service, call (763) 232-7296.